The space-based Kepler observatory has ended its primary mission, but we’re left with an incredible wealth of observations. Until the failure of two of its reaction wheels keeping it stable, the telescope pointed steadily in one direction, monitoring all the stars in that small patch of sky. The advantage of that method: astronomers could watch for changes in light from individual stars over long periods of time. Kepler has been one of the most useful telescopes for stellar astronomy (see for example this study relating surface activity on a star to its gravitational field). However, Kepler’s greatest legacy in the public imagination is its census of exoplanets: planets orbiting other stars. When a planet transits its star — passing between the star and Earth — it blocks a tiny amount of light on each orbit. Patient monitoring of the Kepler kind reveals both the length of the explanet’s year and its size. As with other planet-hunting methods, detection using transits is easiest for very large planets orbiting close in to their stars, but Kepler was both sensitive enough and observed the same stars long enough to identify a number of much smaller worlds. Researchers will continue analyzing Kepler data for some time, but a paper published yesterday by Erik Petigura, Andrew Howard, and Geoffrey W. Marcy provided a summary of what we’ve learned about the census of alien worlds. Specifically, they focused on the possibility of exoplanets somewhat like Earth orbiting within their host star’s habitable zone: the region in which liquid surface water could conceivably exist. The central conclusion is worth repeating: if these estimates are correct, then more than one in five Sun-like stars harbors an Earth-size planet in its habitable zone. Of course, this says absolutely nothing about whether the planet is actually habitable. Venus is an Earth-size planet in the Sun’s habitable zone, yet it is much hotter and rains sulfuric acid. Conversely, Europa and Enceladus are icy moons orbiting Jupiter and Saturn (respectively), but they could be reasonable candidates for life despite being very unlike Earth. Mars falls in a middle category: smaller than the planets Petigura and collaborators considered, but showing signs of a wetter and warmer past. Nevertheless, Earth is the only planet where we know life exists, so it’s our best template when we look at other star systems. What do we mean by Earth-like? Most of the planets we’ve found that are roughly Earth-size are still noticeably bigger. (Sometimes we call them super-Earths, though don’t think of capes.) The paper I’m discussed considers planets with radius 1 to 2 times Earth’s, which conceivably have similar density and composition to our planet. The weakness of the transit method is that, while we can determine sizes of planets, we can’t find masses without more data. That means we can’t be very clear on what the planet is made of, though there are many good reasons to think that small planets are rocky. Beyond the examples of Mercury, Venus, Earth, the Moon, and Mars, I wrote about a newly identified exoplanet where we do have density data last week. The exoplanet Kepler-78b has a radius about 20 percent larger than Earth’s, and has about 70 percent more mass, matching Earth in density, but it orbits so close to its star that no atmosphere is possible…and it probably has a surface of liquid rock. A planet with double Earth’s radius might have similar composition and somewhat comparable surface gravity, so it might still qualify as Earth-like even with four times the surface area. However, the key aspect that makes Earth habitable apart from its distance from the Sun is its atmosphere: we have enough greenhouse gases to trap heat, but not so much to turn us into Venus. We only have partial atmospheric data on a small number of exoplanets, so we have to make assumptions. That gets complicated, which is why this paper used a simplified model. How flux depends on distance: photons travel outward from the star. Since the total number of photons is constant, they must disperse as they travel outward, meaning the same number of photons are distributed over a larger area. 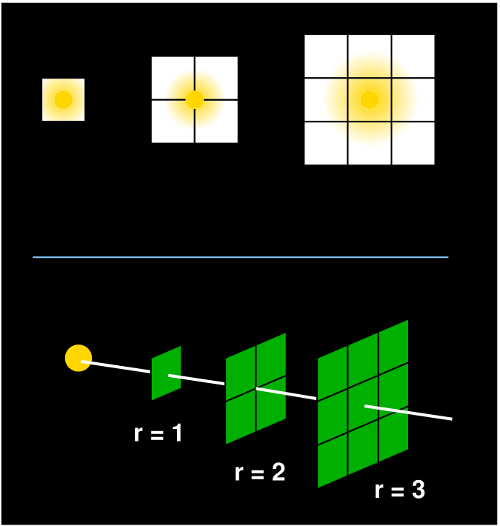 The two images show that distribution increases with the square of distance, so to keep the photon count constant, the intensity of the light must drop with the inverse square of distance, and you’d need to quadruple the size of the planet to block the same amount of light. That’s why the exoplanet census paper considered flux as a proxy for habitability: they could take into account the size of the planet and distance from the star, while glossing over stuff we can’t know yet, like atmospheric composition. If these estimates are right and 22 percent of Sun-like stars harbor Earth-size planets at a hospitable distance, then future observations should find them. As Phil Plait pointed out, this could mean a huge number of Earth-like planets, not least since Sun-like stars aren’t the most common type out there. The census of exoplanets is just beginning, and who knows what we might yet find? Now that it’s unstable, Kepler now tumbles slowly, in part because it’s pushed by light from the Sun. The telescope can still be used because all its scientific instruments are still in order, but the days of steadily watching one part of the sky for exoplanets are over.